My kids love homemade. You should see Stuart’s face light up when he sees fresh bread buns on the table. But they also get excited about prepackaged “stuff resembling food.” And why shouldn’t they? These companies have huge research and marketing budgets to create products to entice my children. And it isnt just the kids: on the rare occasion I go to a supermarket I too will sometimes reach for a pack of Pringles, or a box of granola bars. Tastebud-tempting convenience is difficult for everyone to resist. I’m a big advocate of providing food for my family that is minimally processed. A fresh whole apple in the lunchbox is just as convenient, and must more healthy, than syrupy tubs of apple cubes or sauce. But sometimes, I like to give my kids something as exciting and enticing as the stuff they see in little foil packets. So lately I’ve been experimenting with fruit snack recipes. I’ve tried a few different ones and finally settled on something we all seem to like. 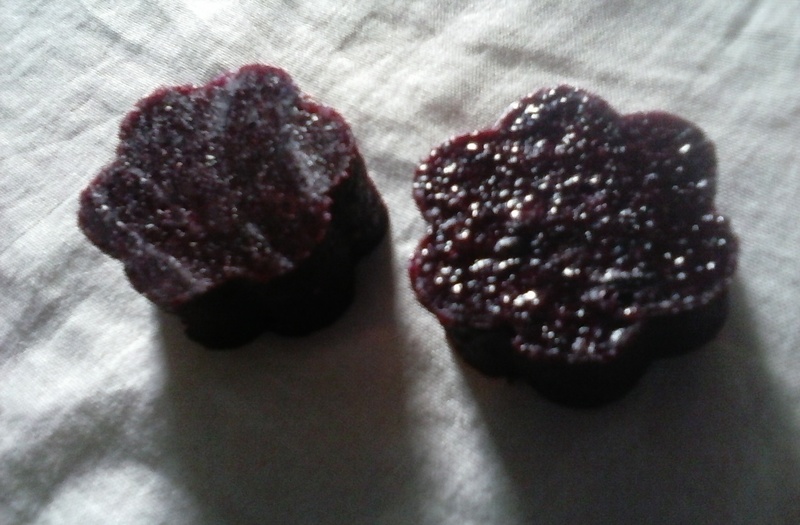 Although I have put them in little molds to create fun shapes for lunches, they seem to find it most exciting when we make our own “fruit snack factory.” For this, I set the fruit snack mixture on a baking tray, and then they get to come and cookie cutter out a few for lunches or a snack when they want them. It adds a little bit of fun to it and they want to eat more when they get to cut them out themselves. Which is fine, because these fruit snacks are super healthy! Here is the recipe. As you can see, it is really simple and only takes a few minutes of your time. Mix the honey and juice/puree, warm, and then add gelatin, whisking vigorously. Pour into molds or on a tray and cool. Yup, that’s really it! If you choose to use a fruit puree, you can make your own by heating fruit and then blending it up. Just allow it to cool for a few minutes before you add the gelatin. Since we have half a freezer full of blueberries, I have been using these. You will notice the amounts are not exact – they will vary depending on what fruit you are using. Blueberries, for example, need less gelatin because of their natural pectin, but more honey because they aren’t naturally as sweet. The good news is, if you mess it up you can just dump it into a pan and gently heat it before adding more of whatever it needs. (I did this on my most recent batch when I doubled the fruit and forgot to double the gelatin! With a little heat and stirring, I was able to add in the extra gelatin no problem.) If your family, like mine, have varying tastes for the sweet, you can always sprinkle additional natural sweetener onto the finished fruit snack, or add more to the mix. I have tried batches with more natural sweetener added in, as well as with a little sprinkle of sugar on the top at the end. Even this little bit of indulgence is much healthier than the kind you purchase in stores, and I was able to wean my kids off of the added sugar after the first time. I’ve really enjoyed these too as an easy, healthy snack. In fact over the last week as I’ve been nursing the flu they are one of the few things I could stomach. These three simple, healthy ingredients (yes, even gelatin has been demonstrated in numerous scientific papers to have many health properties) make a fun and convenient snack for your whole family!